It took three years and three designers to develop FF Meta® Serif. 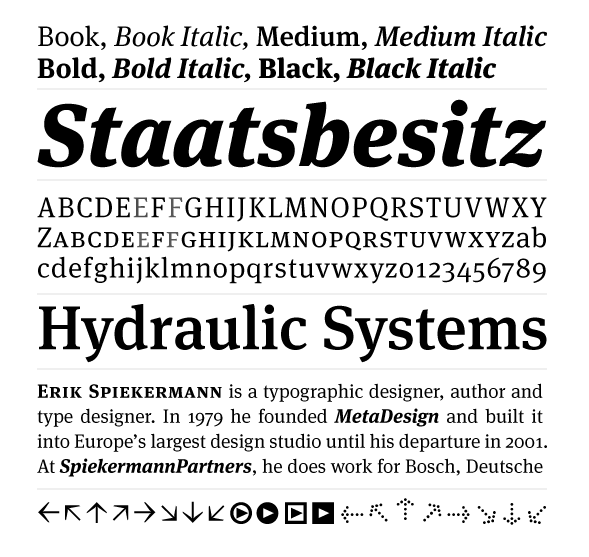 All through the ’90s, Erik Spiekermann made several attempts at designing a counterpart for his groundbreaking FF Meta®. Fans of Meta frequently asked him which serif face would best complement it. He recommended Swift™, Minion™, FF Clifford™, and others, until he realized that he should just buckle down and draw his own serif Meta. True to his principle of collaboration, Spiekermann enlisted the help of accomplished type designers Christian Schwartz and Kris Sowersby. No Comment to " FF Meta Serif "